Police were sent on a routine mission in Western Canada based upon a tip they had received regarding a large marijuana farm hidden in the wilderness. As they made their way through the dense forest they stumbled upon something a bit more surreal. Encircling the compound were a dozen black bears which were seen to be acting as guards over the marijuana crop. Their concerns were quickly calmed after they realized all of the bears were accustomed to living around humans, and were not agressive with the police advance, but were rather docile. As cute as it may sound, unfortunately bears that are tamed by humans have little chance in the wild, and the fate of the animals is unknown. Two individuals have been arrested so far. Even more hilarious is this Canadian host ( for a Russian speaking audience. So turn on the subtitles on the vid! ) who is trying to record a piece involving the story. I’ve heard some funny marijuana stories over the years, but sometimes reality is stranger than fiction! 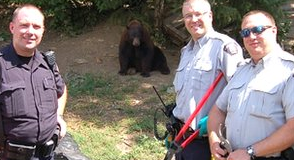 Previous A marijuana farm in Canada had a security team of black bears.